Erik Seidel is one of the best professional poker players in the world. He was born on November 6, 1959 in New York City. Erick has always been a gifted competitor: as a young child he loved games, and by the age of 12 he made an appearance on the television game show “To Tell the Truth.” Seidel started playing backgammon while attending Brooklyn College because he saw opportunity in the game. He eventually dropped out of school and started hanging out at the Mayfair Club in New York City, a legendary card room where backgammon and bridge players could always find a game. He played there for nearly eight years, while traveling to tournaments around the U.S. One day, Erik entered a backgammon tournament in Las Vegas, where he also played a few games of Low Limit Texas Hold’em and started to fall in love with the game. Even though more and more people began turning up at the Mayfair for poker games, Erik’s days as a professional gambler began to wear on him, and he wanted to work from nine to five and earn a steady income. In 1985, Erik got a job as a stockbroker on Wall Street to complement the unreliable income from backgammon; he also supplemented his salary with evening winnings from poker games at the Mayfair. Since then, Erik has won eight World Series of Poker bracelets – only four players have won more gold bracelets than him. 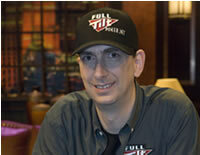 Seidel is also the only World Series of Poker player to win events in three consecutive years. His other accomplishments include placing first in the $2,500 Pot Limit Omaha event at the 2003 World Poker Classic and in the $2,500 No Limit Hold’em event at Festa al Lago II in 2004. Erik won his seventh gold bracelet in the $2,000 No Limit Hold’em event at the 2005 World Series of Poker. Erik lives in Henderson, Nevada with his wife and daughter; he plays tennis and watches independent movies in his spare time. He was a poker pro with the now disbanded online site Full Tilt Poker. Erik Seidel has more than $34 million in live tournament winning and 101 WSOP cashes which puts him in second place all-time for WSOP cashes.